Vietnamese New Year aka Vietnamese Tet ([tet˧˥] or [təːt˧˥]), or more commonly known as Tet, is a wondrous and prosperous time in Vietnam, and is an event that is anticipated throughout the year! It marks the arrival of spring, a brand new start for many of life’s endeavours, and is a time to appreciate and spend time with family. If you are considering traveling to Vietnam during Tet, here are the top 5 reasons to be a part of this joyous celebration in Ho Chi Minh City. 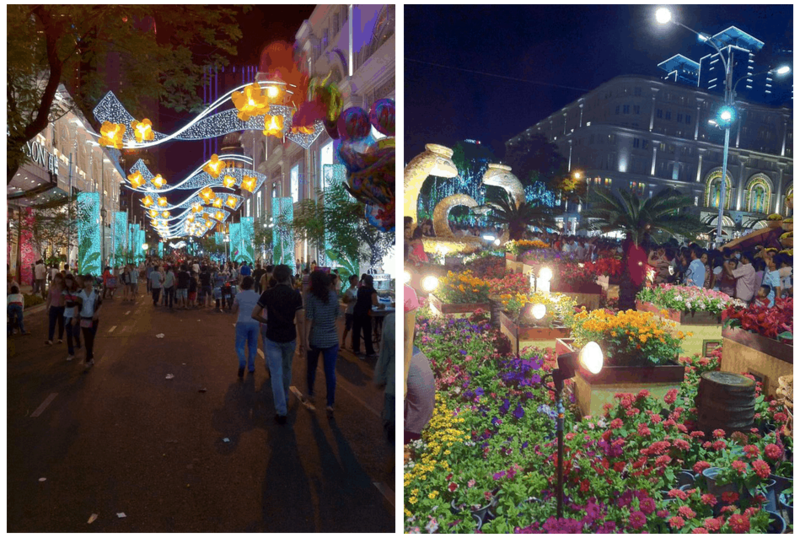 – Ho Chi Minh City is incredibly festive on the days leading up to Vietnamese New Year. Magical is the best way to describe the city during this time! Imagine an entire street closed off to traffic and dedicated to flower displays and fascinating works of art created entirely by lights! Tet is such a special time of year for the Vietnamese people and the country spares no effort or expense in creating a beautiful atmosphere for everyone to enjoy. It is definitely a sight to see! Tet 2013 – Year of the Snake! Spectacular sights around the city. – certain foods and treats are only served during Tet and are considered auspicious and significant for a multitude of reasons. For instance, one of the items you will see at food stalls during Tet is Banh Chung or Banh Tet. It’s a mixture of glutinous rice, mung beans and pork covered with banana leaves and moulded into a square shape. The ingredients and the color of Banh Tet symbolize the offerings of the Earth, and this treat is offered at shrines or temples in order to pray for health and prosperity in the new year. Be sure to give it try! Banh Chung is the iconic food of Tet celebrations. It is made with glutinous rice, mung beans, and pork along with various spices. Then they wrap The mixture up in banana leaves in a distinctive square shape and cook them for hours. – for Tet, people generally visit their families either in their hometowns or in the cities, so you will hardly see people out and about! The hoards of motorcycles and the usual hustle and bustle of the city are at a minimum. It’s a great time to cross the street without fearing the worst! 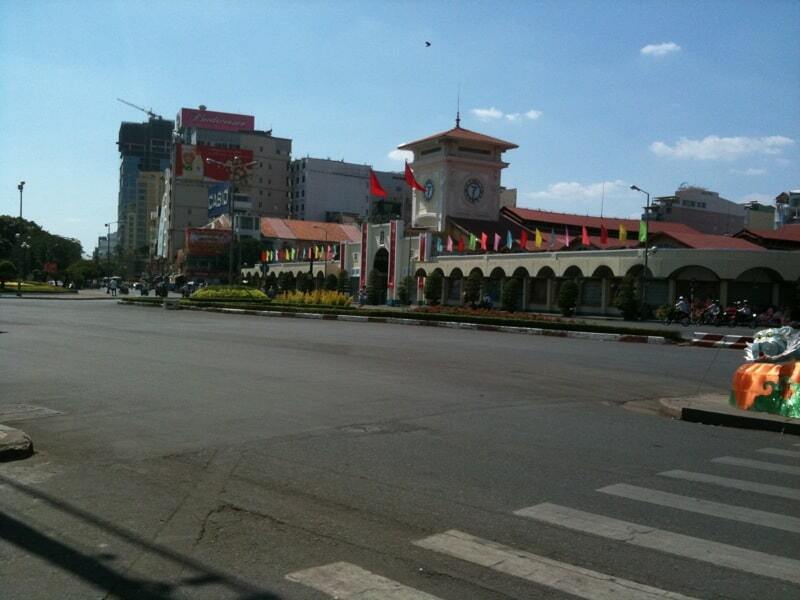 The area at the entrance of Ben Thanh market is one of the major intersections in Ho Chi Minh City. During Tet, all the traffic almost disappears for about 3-4 days! – traveling within the country is generally a little difficult during Tet. It is because of the lack of transportation options or expensive prices. Hotels, on the other hand, are more available because tourists tend to just stay where they are for Tet. Some smaller hostels and bed and breakfasts may close for a few days. However, most hotels are open through Tet and have ample availability. – late January to February is a great time to visit Ho Chi Minh City because the weather is mild. Of course, Ho Chi Minh City has a tropical climate so it never really gets cold. The heat is more bearable than during other times of the year, and it is still within the dry season. The nights get cooler too and you may even get a pleasant evening breeze! The cooler weather coupled with less traffic makes for a great opportunity to wander the streets peacefully and enjoy the sights during Tet! Wishing you a Happy New Year and a prosperous and healthy road ahead! Chuc Mung Nam Moi! We will be delighted to host you on one of our authentic Vietnam tours. Thanks Janot! Let us know if you have any questions about Ho Chi Minh City or Vietnam in general. We’re happy to help. Hope you enjoy your time here. Ben Thanh Market does close for TET. Very helpful tips. Thanks a lot to you. I wish to visit Ho Chi Minh city by the end of November. Hope it will be a great tour.